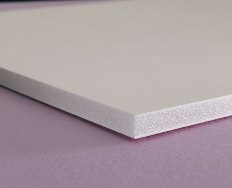 Nielsen Bainbridge Heat Activated White Foam Board 32"x 40"x 1/8"
Every board arrives to you interlined with a barrier paper to protect the ultra smooth surface and can be used in the mounting process as a non-stick barrier paper. As with the self-adhesive boards, this adhesive is archival quality and acid-free and will not yellow with age. Special heat activated coating on one side. Heat activated adhesive is acid and tack free. Use with a dry mounting press to activate the adhesive coating. Provides a smooth, permanent bond. Available in 25 sheet cartons only. White with white core.